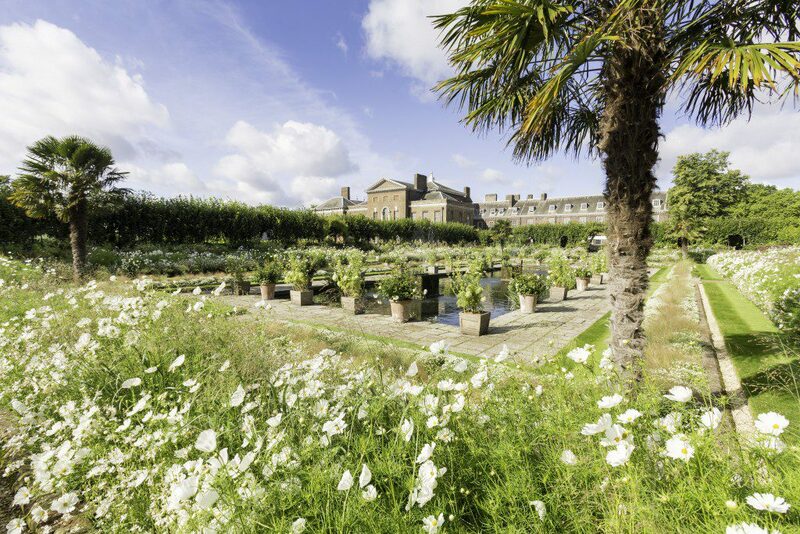 The White Garden at Kensington Palace, planted to remember Diana, Princess of Wales, is in full summer bloom. Designed as a beautiful space for visitors to reflect and celebrate the life of Princess Diana, the summer planting in the White Garden is flourishing. I took inspiration from Princess Diana’s dresses along with the famous Mario Testino photographs of the Princess, which both feature in the exhibition inside the Palace (Diana: Her Fashion Story), to give the ‘feel’ of the planting that is joyful, exuberant and glowing. White roses, a favourite of the Princess, grace large terracotta pots by the reflective pond in the centre of the garden. These are just starting to bud again following their first flush of flowers at the start of summer. 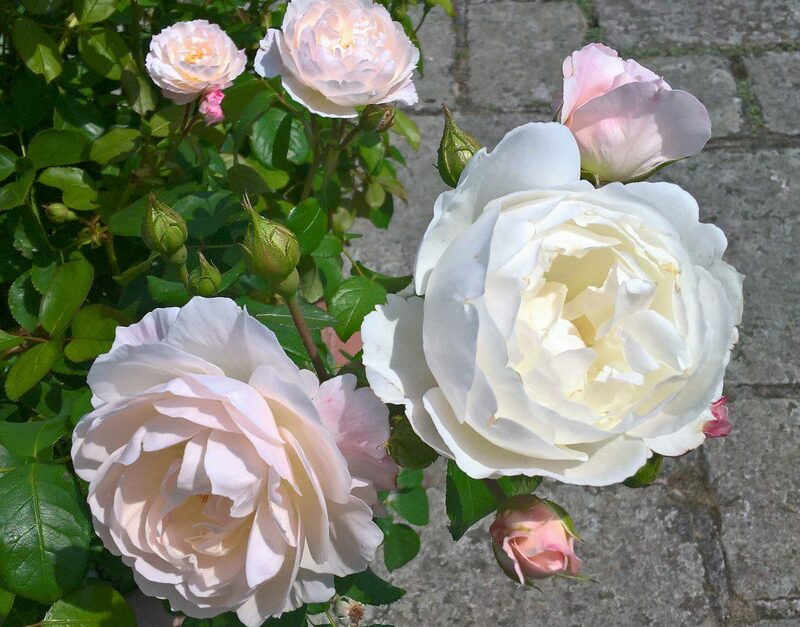 Amongst them, a particularly beautiful variety, Rosa ‘Desdemona’ starts off a peachy pink when in bud, with the flowers opening to a soft white with the most wonderful old fashioned rose scent. 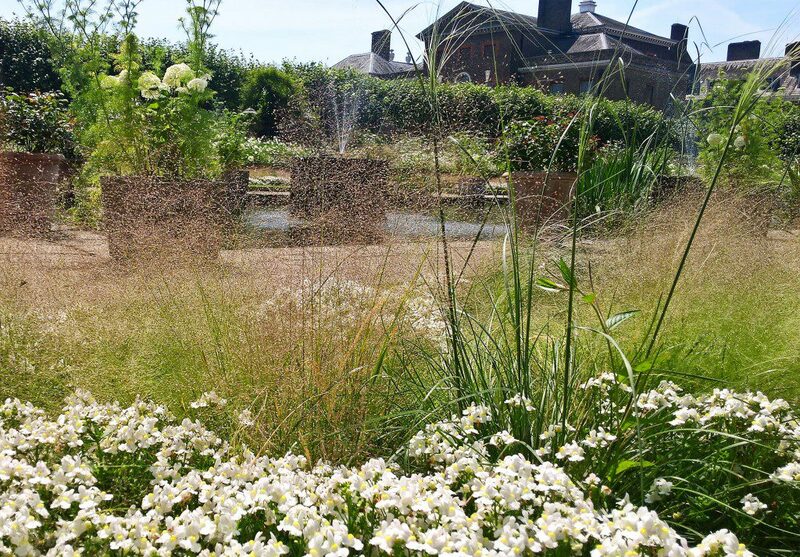 The recent glorious weather has brought on the billowy grasses such as Agrostis nebulosa and Stipa pennata. These give the garden a dream-like quality; catching the light to almost glow and adding movement in the breeze. These are planted in the lower terrace beds as a gentle wave through swathes of Nemesia ‘Sunpeddle White Perfume’, the pretty low white flowers giving off a vanilla perfume that gently surrounds the garden on a hot day. 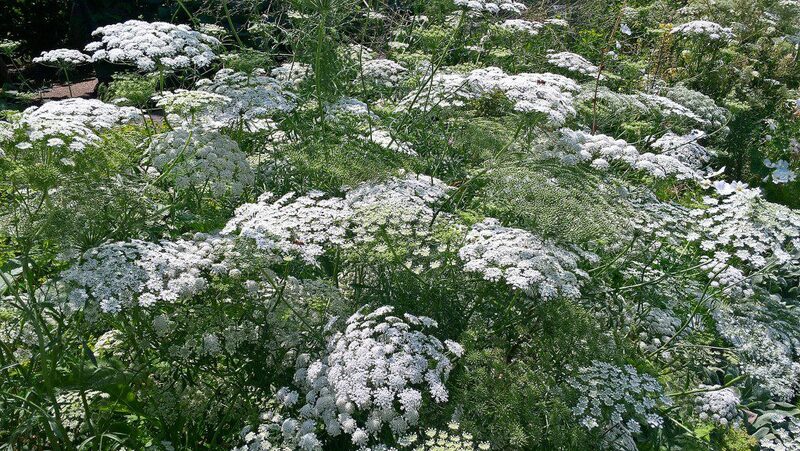 Another highlight Ammi majus, an annual related to the common cow parsley, is currently creating tall cloud-like billows along the outer border, the intricate flowers reminiscent of the lacework on some of the Princess’s dresses. The central layer of planting features large daisy flowers of Cosmos ‘Cupcakes white’, a new variety where the petals open fused together. This is planted alongside Gaura ‘Belleza White’ which has an airy nature, looking like thousands of small butterflies floating above the bed. These plants create a haze reminiscent of tutus at the ballet, fitting as Diana, being patron of many charities, was also the patron of the English National Ballet. 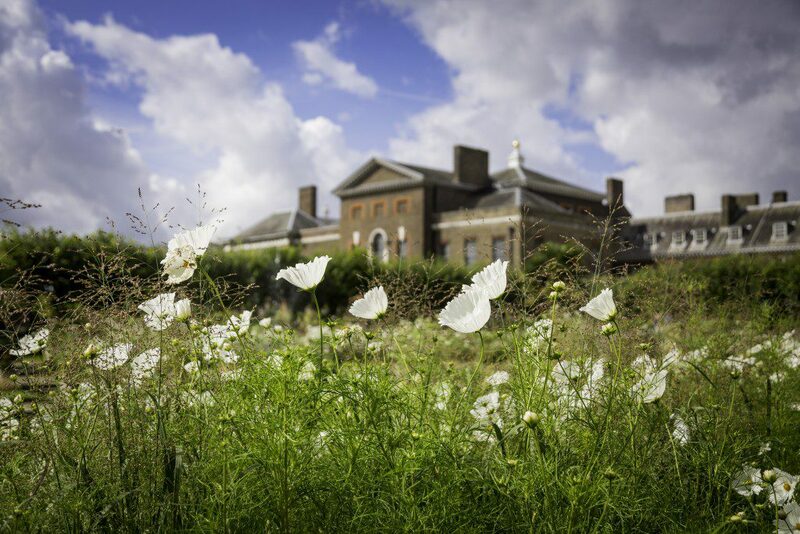 The garden has been a real team effort for me and the small team of gardeners at Kensington Palace. We have been lucky to be supported by our fellow gardeners at Hampton Court Palace who helped grow the plants in their nursery facilities. The public reaction to the garden has been overwhelming and we hope the garden manages to capture the elegance and radiance that made Princess Diana such a loved figure around the world. Thank you Sean for your insight as to the Princess Diana. She was a wonderful Lady. Take care of those beautiful flowers. Is it possible to purchase a photograph of the completed garden?. I visited Kensington Palace last October and have not forgotten sitting looking down on to the beautiful White Garden. I gather the Palace shop sold postcards at the time but sadly no longer. Lots of beautiful photos on YouTube but I have no printer and no idea how to take a photo of a video! Any advice most welcome if it is possible to get a photo which has everything in full bloom. Thank you.